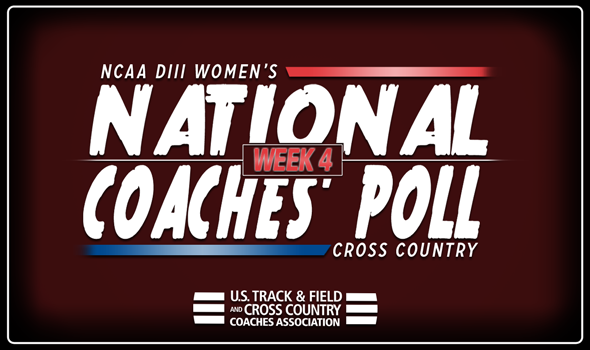 NEW ORLEANS – There were quite a few notable jumps between Week 3 and Week 4 in the NCAA Division III Women’s Cross Country National Coaches’ Poll. The most recent index, released Wednesday by the U.S. Track & Field and Cross Country Coaches Association, saw 13 teams climb three or more spots after a busy weekend. None of those changes impacted the top-4 teams – and for good reason. The top-3 teams – No. 1 Johns Hopkins, No. 2 Washington (Mo.) and No. 3 SUNY Geneseo – all handled business this past weekend, while No. 4 MIT is riding high off its last performance. The Blue Jays finished seventh in the Gold Race at the Paul Short Run, while the Bears took sixth at the Loyola Lakefront Invitational and the Knights won the Mike Woods Invitational. UW-Eau Claire vaulted from No. 10 to No. 5 after a narrow victory at the Blugold Invitational. It was a two-point win for the Blugold, which return to the top-5 for the third time this season. Sam Slattery won her second National Athlete of the Week honor after leading UW-Eau Claire to victory with an individual victory of her own. Carleton is hot on the Blugold’s heels, just like it was this past weekend. The Knights finished runner-up to UW-Eau Claire at its own invitational and actually had a 22-25 lead over the host through three runners. Carleton put three runners in the top-15 led by Emma Greenlee’s runner-up finish. St. Lawrence earned a signature victory this past weekend at the Saratoga Invitational and soared from No. 18 to No. 7, an 11-spot improvement. This is the first time the Saints have been ranked in the top-10 since 2015. St. Lawrence earned the victory this past weekend after it put its entire scoring lineup in the top-20. RPI continues to climb the ballot as it comes in ranked No. 10 this week. The Engineers, who have been ranked at No. 12 and No. 15 this season so far, finished third behind St. Lawrence and Williams at the Saratoga Invitational. Wheaton (Ill.) comes in ranked No. 12 this week following a third-place showing at the Blugold Invitational. The Thunder saw its top-3 runners finish in the top-15 this past weekend, led by Hannah Roeske (third place, 22:11.4). Nebraska Wesleyan won the NCAA Division III team title in the Maroon Race at the Roy Griak Invitational this past weekend. The Prairie Wolves were led by Ellie Beiermann, who finished 12th out of 412 runners. Rochester (N.Y.) flew from the Land of the Not Ranked to No. 21 this week. The Yellowjackets created some buzz for themselves in the Brown Race at the Paul Short Run, where they finished fourth. Rochester put two runners in the top-40, led by Rachel Bargabos in 18th place. Other additions to the top-35 this week include Coast Guard Academy at No. 28 and Allegheny (Pa.) at No. 35. Be sure to check back in throughout the season as the National Coaches’ Poll will continue to evolve ahead of the 2018 NCAA Division III Cross Country Championships on Saturday, November 17 in Oshkosh, Wisconsin.